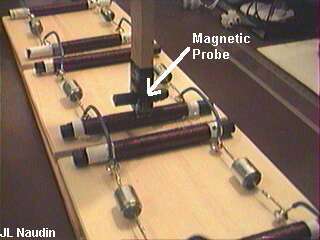 The following is an electric wave experiment to demonstrate the inverse relationship between the coil, or magnetic inductor and the capacitor, or electrical inductor, and their usage in propagation of the electromagnetic field components. 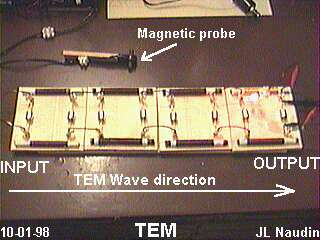 An analog computer is used to study the space distribution of the electromagnetic field component of transverse and longitudinal waves along a transmission line in two different configurations (LMD/TEM). 1. Borderland Labs; Transverse & Longitudinal Electricity [video], BSRF, Bayside, California, 1988. 2. Borderland Labs; Tesla's Longitudinal Electricity [video], BSRF, Bayside, California, 1988. The TEM (Transverse ElectroMagnetic) line is the analog simulation of transverse EM waves propagation in space coming from two parallel wires, this is the conventional flow of EM radiation. 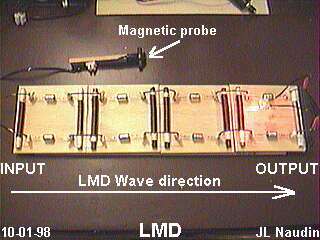 The LMD (Longitudinal Magneto-Dielectric) line is the analog simulation of longitudinal EM waves propagation in space coming from two parallel wires, this is the unconventional flow of the EM radiation. 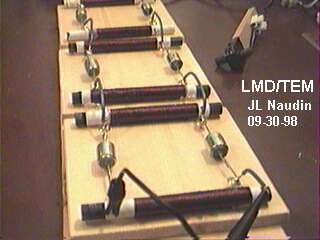 Each coil has been checked (with an LC oscillator circuit) so as to obtain the same inductance ( L=1.58 mH). All voltages measurements have been done with an oscilloscope. 2. Electric Discharges, Waves, and Impulses. Chapter II, by Charles P. Steinmetz, McGraw Hill, N.Y. 1914, 2nd Ed. 3. Symbolic Representation of the Generalized Electric Wave, by Eric Dollard, B.S.R.A. No TE-4, 1985. 4. Symbolic Representation of Alternating Electric Waves, by Eric Dollard, B.S.R.A. No TE-3, 1985. 7. The Principles of the Algebra of Physics, A.McFarlane, American Association for the Advancement of Science, Vol XL (1891-1894) page 77. 8. Condensed Intro to Tesla Transformers, by Eric Dollard, B.S.R.A. 1986. 9. Theory of Wireless Power, By Eric Dollard, B.S.R.A. 1986. 10. Electromagnetic Theory, Oliver Heavyside, Chelsea Press. 11. Theory and Calculation of Transient Waves and Electric Oscillations, "Transients in Time & Space." C.P. Steinmetz, McGraw Hill, 1910 Third Edition. 12. 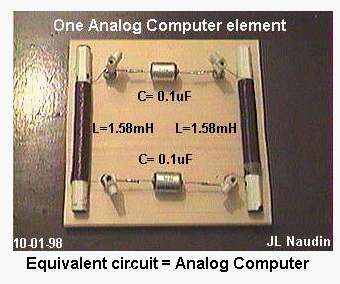 Impedance, Angular Velocities & Frequencies of Oscillating Currents, by A.E. Kennelly, Institute of Radio Engineers, Nov. 3, 1913. 13. Vector Power in A.C. Circuits, A.E. Kennelly, Proc. A.I.E.E., June 29, 1910.